You ever see something on the Food Network and say to yourself, “Wow, that looks amazing, I need to make that”. How often do you actually make it? Well, I’m often guilty of not following through, but this time I actually made something with a little help. 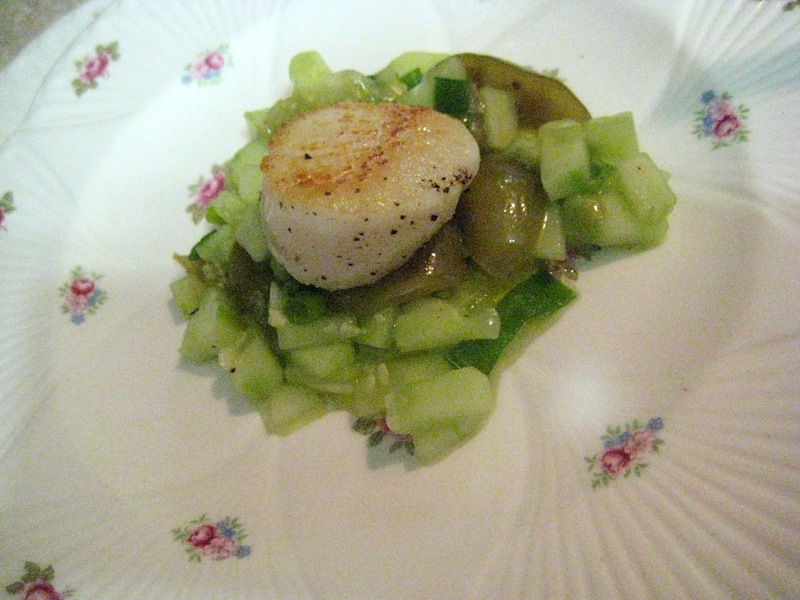 I had watched Chuck Hughes of Chuck’s Day Off on the Food Network a while back and he made this great green gazpacho which served as the base for a perfectly grilled scallop. Chuck made it look amazing so I had told myself I should give it a shot one day, but filed it away for a rainy day activity. Fast forward about a month and I was chatting with my friend Lora, the Cake Duchess (she’s on my blogroll, go click and say hi to her) about needing to find a simple, yet elegant dish. She said she had just the thing and sent me the link to something she had recently seen and it turned out to be the very same scallop and gazpacho. It was fate, so I had to make it, so I did! The best part of this dish, is that it’s one of those things that looks wonderfully chic and it’s not overly complicated. If you’re a fan of seafood, you can never go wrong with a sweet scallop. As for the gazpacho, the tomatillos is a perfect match to the crunchy cucumber. To make the gazpacho: Add the diced cucumbers, tomatillos, onions, and garlic to a mixing bowl. Pour in the olive oil, and sprinkle with the salt, and black pepper, to taste. Stir to combine and set aside to allow the flavors to blend.To make the scallops: Score the scallops with a small knife in a checkerboard pattern. Cook’s Note: This will give the scallops a nice ‘browned look’ once they’re seared. In a hot pan, add enough canola oil to line the bottom and sear the scallops on both sides until barely cooked through, about 30 seconds per side. Once cooked, they should just lose their translucent color. Serve the scallops by arranging the scallop shells on a platter. Place a dollop of the gazpacho onto each shell, and then top with a single seared scallop. Add a drizzle of olive oil and, lastly, a dusting of salt, and pepper. Oh that green gazpacho looks lovely! Thanks for stopping by Mardi! Merci pour le compliment!